This past Friday Buddha gracefully, easily and peacefully slipped out of her 13 year old, arthritic body as I held her head in my arms and whispered, “thank you, thank you, thank you!” We didn’t just say goodbye to a cow; we said goodbye to a teacher, a leader, a councilor, a great mystic, a friend and a mom. Back in the beginning of The Gentle Barn, in May of 2000, someone told me about a miniature cow breeder in Washington State. I just had to call the guy to ask about this cow because I had never heard of a miniature cow before. 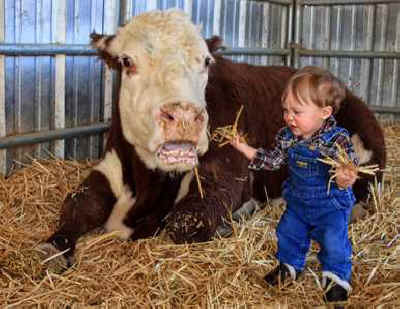 He said that he raised miniature cows because they were small and gentle; easy to raise, easy to keep and easy to kill!? As he was rambling on about how gentle his cows were, he started telling me about a particular cow who was SO gentle that his grandchildren were raising her. She was a year old and couldn’t have babies, so sadly they were sending her to slaughter the next day. I couldn’t believe it! He had described her as so kind and safe for the kids and wiling to tolerate anything they wanted to do to her, I couldn’t believe that such a life would be thrown away because she couldn’t make money. By the time I hung up the phone, I had talked him into giving her to me. I made arrangements to have her driven from Washington to The Gentle Barn in California and I had saved my first cow! When “Buddha” came off the trailer the first day I met her, she looked like an angel in a cow suit. She was warm and fuzzy and she smelled so good and she looked like she was smiling. Her eyes twinkled and I felt loved and accepted right away as if we had known each other our whole lives. Buddha allowed me to easily lead her into the barnyard and she went nose to nose to all the animals and walked around the yard completely comfortable and at ease. I was so excited to have her in my yard that I could hardly sleep. That night I kept walking out to the barnyard to watch her sleep peacefully among my other animals. How could I sleep in my house when I had such a magical creature in my very own backyard?! She took my breath away and I couldn’t tear myself away! It was clear immediately that Buddha was no ordinary cow and that she would be very special in my life and in the work of The Gentle Barn. Every time we would host groups of children or be open to the public Buddha would lay down in the middle of the crowd and invite, or practically insist to be hugged by everyone. She had the patience of a saint and when someone was leaning on her or snuggling next to her she wouldn’t move a muscle, ensuring the child’s safety. Late at night if I felt stressed or sad for whatever reason, I would go to Buddha and sit next to her and look into her wise eyes, that seemed to know the wisdom of ages and the secrets of the gods. Buddha would wrap her neck around me and hug me back and I would put my face into the back of her ear or her neck and I would feel warm, protected and completely safe and loved. SHE was healing ME! Buddha very quickly became the chief ambassador of The Gentle Barn working with special needs children, with her patience and kindness. She worked with at risk children, lowering their defenses and helping them become vulnerable and open, and often bringing people to tears as they received her mutual embrace. Over the 12 years that Buddha served at The Gentle Barn she doled out over 300,000 hugs, worked with thousands of inner-city, at risk and special needs kids, she held still while people in wheel chairs brushed her and precariously leaned over to hug her, she adopted and raised orphaned or lonely animals, and she taught me, loved me and saved me every day she was here! But most importantly, Buddha showed hundreds of thousands of people that cows are not food. That they are special and deserving of love and compassion just like you or me. On August 17 Buddha gracefully, easily and peacefully slipped out of her 13 year old, arthritic body as I held her head in my arms and whispered, “thank you, thank you, thank you!” We didn’t just say goodbye to a cow; we said goodbye to a teacher, a leader, a councilor, a great mystic, a friend and a mom. I don’t even know how it’s possible to have a Gentle Barn without Buddha here! As one of our volunteers wisely stated, Buddha was The Gentle Barn! But when animals leave us, we find a way to move on; no matter how impossible that seems to us right now. And Buddha wouldn’t have it any other way. To every staff member who took excellent care of Buddha, especially toward the end when it was difficult for her to get up and she needed to be served water and food every hour, thank you! To every volunteer who brushed her, kept her clean, free of flies, loved and appreciated her, thank you! For every visitor around the world who had the honor and the privilege of meeting Buddha, who was touched by her, inspired by her, who shares in our grief, thank you! For every one of you who know how much Buddha meant to me personally, who knows that I meditated with her every night, that I snuggled with her every morning, that I talked about her every Sunday, that I worked with her every day with the children we host, who knows that I can hardly breath right now with out her, who is holding me in their hearts, sending me light or prayers, thank you! And thank you, thank you, thank you Buddha for showing me unconditional love, for always being here for me, for raising me, for teaching me, and for being a mom to me!